It’s time again to catch up on the latest related to Star Trek: Discovery starting with some interesting comments from the guy in charge of the show’s props. We also have a delicious update from the writer’s room, some behind the scenes video with Doug Jones, and more. Of course rank pips on the uniforms were also used on Star Trek: Enterprise, set a century before Discovery. 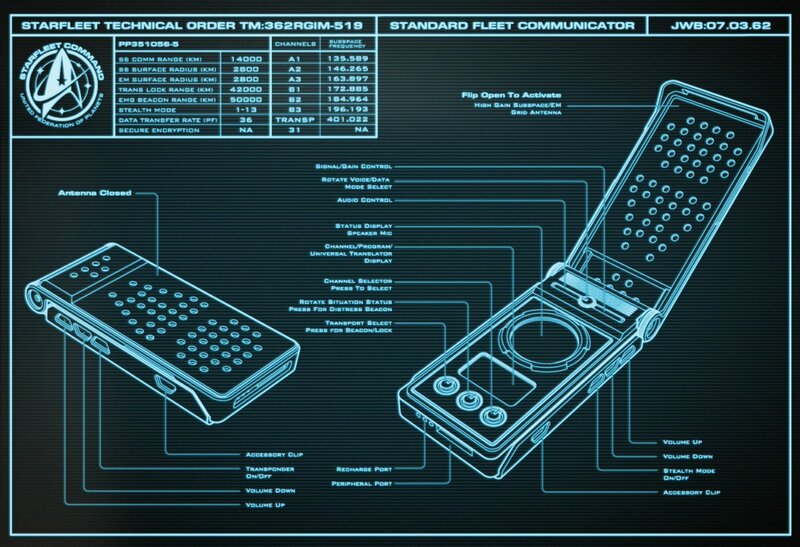 Following on from their tweets about the Tricorder and Phaser, which we covered in our last news round up, CBS also posted the technical schematics for the standard issue communicator. Yesterday the Star Trek: Discovery writers room – busy working on season two – revealed they got a special delivery from star Sonequa Martin-Green. In a profile by The Great Big Story, Doug Jones talks about the many different creatures he has played in film and television. In the video below you can also see some behind the scenes on Discovery, where Jones notes that the 2-hour process to transform him into the Kelpien Saru is actually short compared to some of his other roles. Speaking of Doug, the actor was at the Academy Awards on Sunday where he appeared on stage as The Shape of Water won Best Picture. He shared some photos on Twitter from the night. – Huggles & statue groping of @RealGDT 's Oscars. – Embracing my costar Sally Hawkins. – On-stage mayhem during Best Picture acceptance. One of the notable things about the season one finale of Discovery was that it used the music theme for the original Star Trek with the end credits. Well Leandro Martins on YouTube took that idea to the next level by redoing the end credits of Discovery in the same style as The Original Series. On the end credits video, Nice touch on the last frame before production company cards! You appear to have relished it as much as I. So happy to see Trek Brasilis’s Leandro Martins work being highlighted here! Much love for his recreation of TOS end credits! The rotating barrel is very much like The Cage phasers though. Ugh, one detail where it wouldn’t hurt to ignore canon. Are you kidding? It’s probably the best looking phaser prop out of all of them, ever, and looks SO very much TOS except with better detailing and build quality. The only thing you’d need to do to make it TOS ideal is swap the emitter for a brushed aluminum one with an acrylic center rod. That prop is what everything on STD -should- have been, the original design only with better materials and detailing and subtle improvements. Much the same could be said for the 1701 Enterprise that appeared at the end, it’s a beautiful model that retains all the core aspects of the beloved original while making subtle improvements to bring it up to modern quality standards. Basically, if everything on the show was done that way, a great majority of the people who have been so critical of the show would have been a lot more satisfied if not actively enthused. I like everything about it but the end piece shown in the above picture. Just makes it look like a gardening tool. I agree, Darth. They did a great job on the props and on the new old Enterprise. Really, home runs. The writing, well…. Let’s stick with the positive. Props guys did great. As hard as it might be to believe- especially given the avalanche of hate Discovery appears to generate in here- the great majority of people is actually only a tiny, but extremely vocal, cohort of fans. On Oct. 20, 1951, the CBS Eye made its debut on the airwaves. Creative director Bill Golden, who designed the logo, was inspired when he drove through Pennsylvania Dutch country. He became intrigued by the hex symbols resembling the human eye that are drawn on Shaker barns to ward off evil spirits. He also came across a drawing he admired, that had the look of an eye, in a Shaker art book from the 1950s. With the help of graphic artist Kurt Weihs, the Eye logo was created. Agreed, on the last count especially. Lurv the Disco phaser, but I wish they hadn’t shown the TOS phaser and communicator in the credits and not even shown the Disco communicator. Much of the show is not my cup of tea but the props are a home run! I once saw a picture of L’Rell receiving flowers from ???? Does anyone know where I can find that photo? Yes it was L’Rell and Voq. We’ve covered it before. It’s from a Mary Chieffo tweet as well. Still get chills when the Enterprise comes on screen. Daggoneit. Stop making me love you Discovery. Maybe you don’t love Discovery. Maybe you are in love with Discovery’s love of TOS. Is the Enterprise they show the one captained by Robert April or Christopher Pike? Those aren’t official end credits until I see Susan Oliver painted green, and even then STD is still not “official”. That end credits sequence is brilliant. Regardless of cool props, the silly bombastic plot line with no depth and meaning will never hold sustained interest, and this is from a lifelong Startrek fan. I am sorry, but this series is not Star Trek, unless you change the writers. Even the actors know they are not performing in a quality series. Good job props. OK job Disco. Proud of you for being daring. Not so proud of the end result, but you get another chance and I can’t wait to see what you do with it. Discovery suffers from major suckage in many areas…but the prop design isn’t one of them. I’ll definitely be buyin the McFarlane repo’s. Credit where credit is due. I rather like the attention to detail on the props and such. It’s one of the things STD did very very well. The problem with the show was not the props or other production values. Those were all top notch. It was the plot and story execution where the show failed miserably. SMG is evidently a much nicer person than I am (not always a high bar, I know). Because if someone saddled me with a line like “We must not stray from the path of righteousness,” I might well offer them something to eat in return–but it wouldn’t be cookies. So much win in that version of the end credits! Since they were including the TOS nod, why not?